This work is derived from a personal project called Leaf Prints, undertaken while studying photography at R.I.T. I drew inspiration for that early work from the photograms of Anna Atkins, Fox Talbot, Man Ray, and others. My own process involved exposing autumn leaves directly onto large format color sheet film to produce a negative, which was then printed. The project continued for over 20 years. Leaf Print Project II, my second version of in-studio leaf photography, relies on high resolution DSLR imaging rather than film. It combines transillumination (back lighting) with traditional front lighting, producing works with photogram-like properties. These new images lack the film ID notches and hanger-processing marks characteristic of large format film but are still presented on a 4x5-shaped white background. 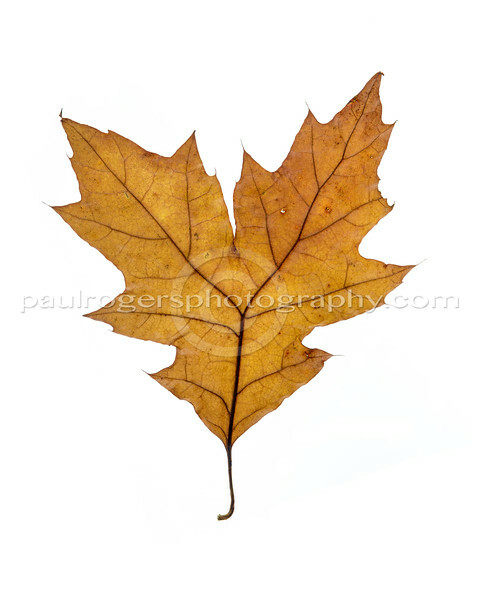 This is a Leaf Print from Paul Rogers' original project. The leaf was positioned on 4x5 sheet film in total darkness before being exposed to light from an enlarger. The leaf acted as a filter, leaving an image of color, form, and texture on the film. Film ID notches and incidental processing marks were left in as identifiers of the photographic process. This was a cool leaf.